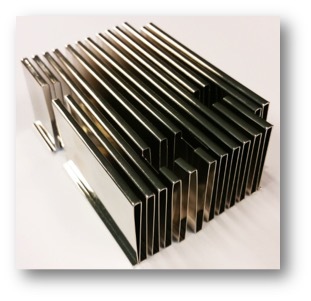 Folded fin heatsinks are manufactured by bending aluminum or copper sheets into a variety of fin shapes which are then bonded to a separate base. 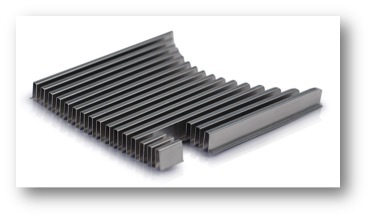 This type of folded fin heat sink allows the base and the folded fins to be manufactured from different metals. This can be an excellent choice when your needs require a thin folded fin that can be light weight and with a different material for the base, thus lowering your overall materials and tooling costs. Fins can be as high as 1 inch. If you are not sure that a folded fin heatsink is the right choice for your needs, our experts have knowledge that can help you make the right decision for both cost, tooling time and delivery date.